You put a lot of effort into designing and decorating your home, so when something purely functional—like an AC unit or a radiator—causes a painful eyesore in your home, you can't help but be frustrated. And while we need these things in our house, we don't have to live with the distracting effect that they can have on our space. Though you may have grown to begrudgingly live with some of these unsightly items in your home, we've rounded up the best ways to cover them, so you can focus on making your house look more like this one from Sugar & Cloth. Whether you want to cover up that dusty old fuse box or you want to never see a popcorn ceiling again, these are our favorite ideas. Air conditioners are great for cooling down your home, but they can have a chilling effect on your carefully considered design scheme—especially for apartment-dwellers who don't want to spend the winter months staring their AC in the face. Good news: With a little effort, you can tuck any AC behind an attractive cover, like this DIY'd one from Vintage Meets Glam. Take a simple box frame, some laser-cut wood panels from Michael's and a bit of white paint, and you've got an AC cover with a bit of vintage flair. Who knew air conditioners could be glam? This DIY from blogger Adventures of an Almost 40 Year Old Intern proves even the ugliest, most style-free parts of your home can be a blank canvas for creativity. This gold-flecked design comes together with some wood (get it cut to size), decorative paper, spray paint and gold disks, for a look that's reminiscent of hammered metal or a nailhead trim. While we've been focusing on window ACs so far, anyone with central air knows that outdoor units can be a real blight on your perfectly manicured backyard. Fear not: There's a solve for that. One idea we love is this enclosure from Ugly Duckling House, which repurposes pieces of a picket fence to hide an outdoor unit. While you'll need some serious woodworking skills to execute this one, you'll thank yourself the next time you throw a backyard barbecue. Creaky old radiators are right up there with air conditioners when it comes to common at-home eyesores—and buying a big, boxy radiator cover can feel a little bit like replacing one design blight with another. 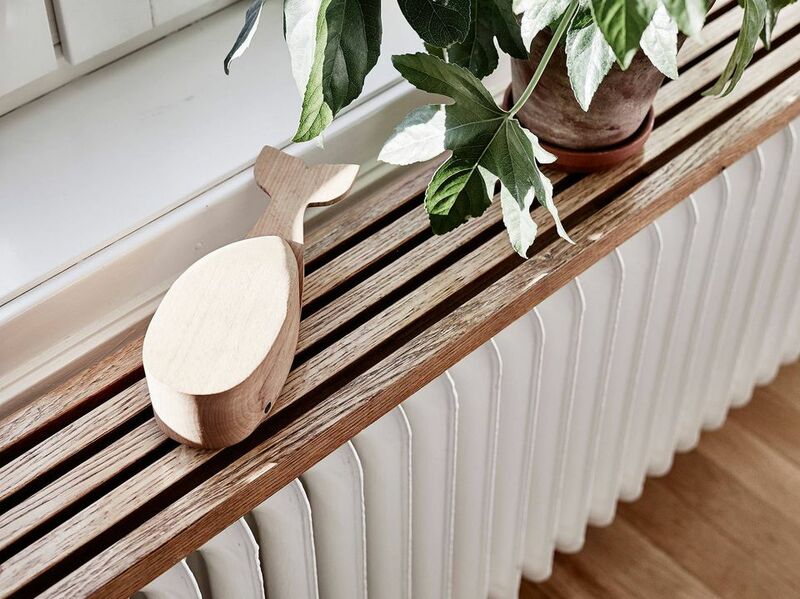 So why not create a charming distraction, like a wooden shelf that hangs just above your radiator? Coco Lapine Design's narrow, midcentury-inspired shelf is set off at the perfect height to draw the eye away from the radiator and toward an array of artful knickknacks, and it couldn't be simpler to DIY. Just be sure to allow for some separation between the radiator and the bottom of the shelf—the last thing you want is an accidental fire hazard. Not up for creating a radiator cover from scratch? Take this shoe rack-meets-radiator cover from Engineer Your Space as inspiration, and hack an existing piece of furniture to repurpose it as a stylish (but functional) form of camouflage. IKEA dressers can work well—just cut a radiator-sized hole in the back, replace the doors on one side with a grate, and voilà! Radiators are hardly exclusive to bedrooms and living rooms. They can be a distraction from that perfectly appointed bathroom, too. Like the previous designer, Miss Mustard Seed used a radiator as an opportunity to add extra charm to a small bathroom. The addition of shelving on the right side of this radiator cover adds storage to a narrow space, while the white paint pairs nicely with the clean, light penny tile on the floor. Fuse boxes may be a crucial part of your home's infrastructure, but they always seem to be built smack in the middle of the wall—how are you not supposed to notice that every time you walk by? Pretty easily, as it turns out. Just grab a drop cloth and a few of your favorite stencils, as seen on Designer Trapped in a Lawyer's Body, and you'll have an easy, DIY'd cover that will help mask your least favorite electrical eyesore while keeping its important contents accessible. For a slightly more involved (but equally cute) DIY, go with a design like this one from Heather Thomas Crawford. Wood panel quote signs like this one can be found at most craft stores, or even places like Target or Walmart—just pick one that's slightly larger than the dreaded fuse box and screw some hinges into the wall, so the cover swings open when you need to get inside. But if that's too challenging, you can also hang the sign like a picture and simply lift it off the wall when you need to access the fuse box. Poles in your basement may be structurally important, but no one likes looking at them. But if you're willing to get a little creative, you can actually turn them into one of your space's biggest assets. Just look at this incredible work posted by Pinterest user cardboard_dad, where a lowly support pole provides the whole raison d'etre for a DIY that transforms a basement into a kid-friendly forest, complete with a rope swing. A small project? No. Worth it? 100 percent. If reimagining your entire space solely to cover up a support pole is out of the question, you could always take a cue from this whimsical, nature-inspired look shared by Oregon Live. All it takes is contact paper and a bit imagination to turn a support pole into a clever design element. Pairing the pattern used on the pole with a similar graphic wallpaper also helps to camouflage it within the space. There's no rule that says the structures keeping your home standing need to be ugly. You can always cover up unsightly ones with some inexpensive wood or faux-wood beams like this version from Katie Garrison's Pinterest. Just choose a stain, pick out a few complementary details (like the rubber strapping seen here) and you'll never know there's a second set of poles hidden underneath. Popcorn ceilings are a common feature in older homes, but removing them can be timely and expensive. 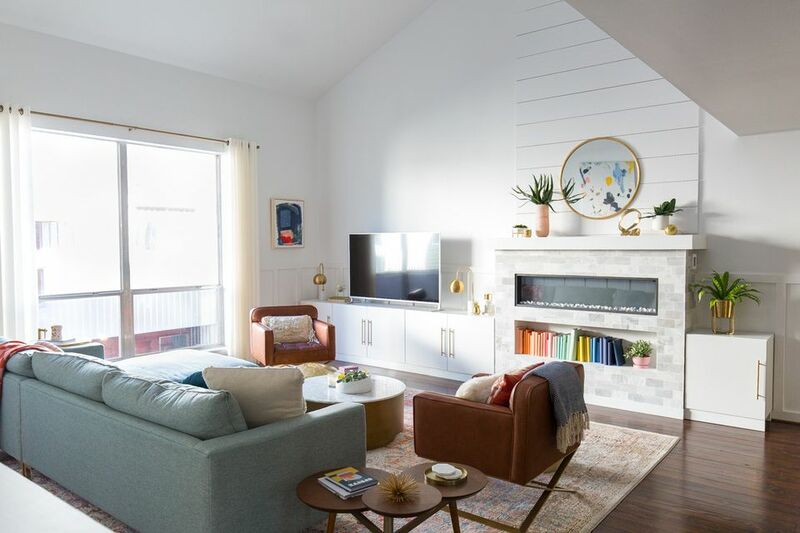 If you're looking for a cost-effective DIY, HGTV shows how you can tuck your popcorn ceiling away behind some tongue-and-groove wooden planks. While it's at least a weekend's worth of home improvement, the result is a virtually new ceiling, complete with crown mouldings—and don't worry, you can cut around light fixtures so you don't have to give up your favorite chandelier. While popcorn ceilings have long since gone out of style, tin ceilings—another vestige of an earlier time—have stayed in vogue. Faux-tin tiles are inexpensive and just as effective for covering up an unwanted popcorn ceiling, as seen here on Designed Decor. With a little effort, you'll be trading out those dated 1970s vibes for some prewar Manhattan cool.